One thousand, two thousand–hey, what’s this? Ka-Boom! Auditors came to a bank in Wellington, Colo., to go over the books and count the cash. Alas, somebody forgot to remove the exploding dye packs from the money before handing it over to them. In an effort to scam her insurance company with a phony claim, a woman in Paignton, England, reported that a burglar had broken in and taken her 52-inch, flat-screen TV out through her living room window. Detectives measured the window and found that it was too small for this to occur. They found the TV upstairs under a bed. It may not smell like a rose but a New York City sewage plant is offering on Valentine’s Day. The tour host and superintendent of the Newtown Creek Wastewater treatment plant in Brooklyn tells the Daily News it’ll be a unique date, and one that special someone will never forget. Jim Pynn says the highlight of the tour will be the plant’s giant egg-shaped digesters, which break down the noxious waste into harmless sludge and gas. Pynn says each Valentine’s Day visitor will get a Hershey kiss — and at least something to talk about. 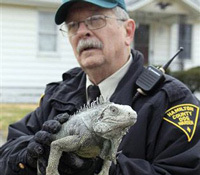 David Jones, deputy dog warden with Hamilton County SPCA carries Godzilla, an iguana after it was rescued from a home that caught fire in Mt. Healthy, Ohio, Thursday, Feb. 9, 2012. Several dozen animals have found temporary shelter after Ohio firefighters rescued at least 60 pets from a house fire in a Cincinnati suburb. Authorities couldn’t say Friday the exact number of animals rescued but Harold Dates of SPCA Cincinnati put the number at just over 60. He said the animals were well cared for but a “little shaken up.” He said they went to rescue groups, volunteers or friends.